Sam Albutt struck 74 for Wisbech against Saffron Walden. Ramsey have taken a 16-point lead at the top in Cambs Division One, with a little help from their friends at Wisbech. Ramsey now boast the only unbeaten record in the top flight after they beat Burwell seconds, while Wisbech were thrashing Saffron Walden - both matches were determined by run rate after rain washouts. Tariq Aziz made 80 not out for Godmanchester at Ketton. Saffron Walden, the hot favourites to win the title pre-season who started the day with four wins from four games, more than met their match at Harecroft Road where the home side piled up 287-6 from their 50 overs. Captain Sam Albuitt led the way with a barn-storming 74, fellow opener Danny Haynes added a more sedate 69 before Josh Bowers played with style and skill for 40. Saffron Walden were well behind the asking rate on 113-5 when the match was abandoned. Seamer Paul Edgller (3-21) had delivered fatal blows early in the visitors’ innings. Wisbech are now second in the table ahead of a big weekend of games at Godmanchester (May 28) and Ramsey (May 30). Ramsey skipper Michael Cafferkey was unbeaten on 44 when the rain caused an abandonment at Cricketfield Lane. Ramsey were 125-4 chasing 185. Elliott Cafferkey (4-44) and Mark Edwards (3-10) bowled well for the Rams. Godmanchester are tucked nicely behind the top two after winning at Ketton yesterday, again on run rate. Goddy were almost home when a prolonged spell of bad weather caused a halt. Peterborough-based Tariq Aziz was unbeaten on 80, after being missed on 20, with Goddy on 133-3 chasing 162. Shakir Mahmood (52) continued a fine run of form for Ketton who are in the bottom two after one win in five matches. Nassington are comfortably in mid-table after a 56-run home win over Blunham. 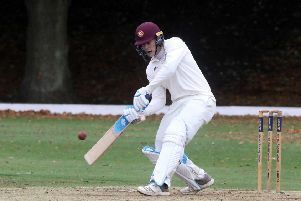 In-form pair Tom Norman (71) and Alex Laud (54) were again the batting stars as Nassington totalled 193, adding exactly 100 for the third wicket. Skipper Laud has now passed 50 in his last three Division One innings to help overcome the absence of injured batting star Dan Robinson who faces at least another month on the sidelines. Laud’s 275 runs in five innings is the second highest in the top flight behind Eaton Socon skipper Jonny Carpenter who is already close to 400 runs. In Division Two March Town continue to go well as they beat Ufford Park on run rate. Brandon Phillips, brother of skipper Tyler Phillips, top scored with 67 of March’s 199 and the home side were 106-5 at the close. Newborough suffered a quick death at Granta seconds. Stewart McCracken top scored with just 15 as Newborough were shot out for 80, a total the home side passed for the loss of just three wickets. Ketton 162 (S. Mahmood 52, L. Davis 25, P. Rowe 22, P. Swannell 4-28). Godmanchester 133-3 (T. Aziz 80no, J. Phillips 20). Nassington 193 (T. Norman 71, A. Laud 54, M. Pickard 6-24). Blunham 137 (C. Heaps 42, D. Aloia 28, D. Bandaranaike 3-34, T. Norman 3-42). Ramsey 125-4 from 28 overs (M. Cafferkey 44no, O. Stevens 21). Wisbech 287-6 from 50 overs (S. Albutt 74, D, Haynes 69, J. Bowers 40, J. Gollands 26). Saffron Walden 113-5 from 26.5 overs (N. Odedra 51no, P. Edgeller 3-21). Newborough 80 (J. Cowan 4-22, T. Clarke 3-26). Granta 2nds 81-3 (J. Cowan 36no). March 199 in 49.4 overs (B. Phillips 67, T. Nulty 26, J. Harradine 21, T. Phillips 20no, W. Dallas 3-26). Ufford Park 106-5 from 29 overs (R. Keymer 39).